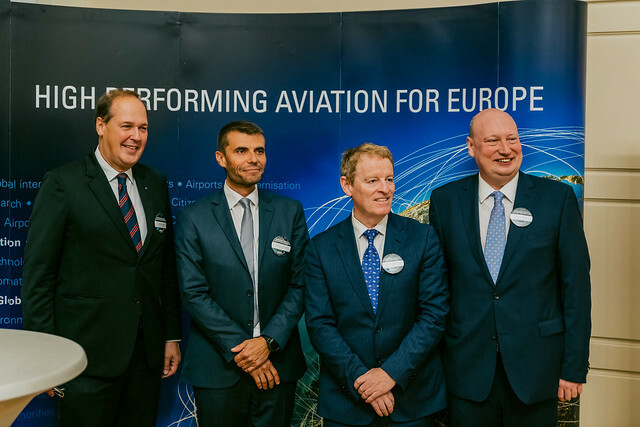 European aviation leaders gathered on 8th of November in Tallinn to show their support for the digital transformation of their industry, and SESAR as the vehicle through which to achieve this ambitious goal. Initial analysis suggests that with a digitalised infrastructure, the industry could directly unlock around EUR 10 billion per annum from 2035. The meeting follows a declaration by industry underlining the urgent need to act now in order to enable more connected aviation and with that seamless travel and transport for all. An in-depth stakeholder-wide consultation will now begin on the modernisation of Europe’s aviation infrastructure and air traffic management (ATM) system. The results of this consultation will be published in the fourth edition of the European ATM Master Plan, due for publication next year. The world of aviation is changing, starting with the aircraft itself. In the not-so-distant future, air vehicles are set to become more autonomous, more connected, more intelligent. The services relating to the transport of passengers or goods are evolving too. Tomorrow’s passengers will not make choices primarily on their mobility needs: They expect to get from A to B, door to door seamlessly, safely and efficiently. The next 10 years will be a critical period to pave the way for the digital transformation of aviation. Aviation’s infrastructure and ATM will play an essential role in this process, as it will have to adapt in order to cater for the growth in traffic and diversity of air vehicles in the sky. Initial analysis suggests that with a digitalised infrastructure, the industry could directly unlock around EUR 10 billion per annum by 2035, which could be tripled by 2050. A digital infrastructure would make a significant contribution to European citizens’ well-being, while strengthening security and fostering positive spill-over effects, such as saving time for travelers or reducing CO2 emissions. Recognising the potential opportunities, European industry leaders representing manufacturers, solutions providers, airspace users, airports and air navigation service providers, published a signed declaration, stating : “To help enable this we will co-invest in the future of ATM research and development, through the successor of SESAR 2020, to collectively deliver a single, safe and secure digital European sky, that will allow Europe to maintain global leadership in this digital future”. An important means to ensuring that digitalisation is mapped out, developed and effectively deployed will be through the European ATM Master Plan, the European roadmap for ATM modernisation. The 2015 edition flagged this digital shift, referencing the aspirations of the EU Aviation Strategy and Flightpath 2050. The 2018 edition will bring together aviation stakeholders for a 12-month consultation to further investigate the potential of technological advances and identify the key development and deployment activities needed to bring Europe’s aviation infrastructure into the digital age. “It is clear that a digitalised, modern, harmonised and efficient ATM system, with a global outreach, is instrumental for the success of the EU Aviation Strategy. SESAR has a decisive role to play as the technological pillar of the Single European Sky, it is naturally also its digital pillar. SESAR will therefore play a major part in identifying, developing and deploying the elements of the new digital ATM system,” said Henrik Hololei, Director General of the European Commission Directorate-General for Mobility and Transport (DG MOVE), and Chair of the SESAR Joint Undertaking Administrative Board.